Thembalethu Foundation was formed to change lives of the girl child and bring hope through football. 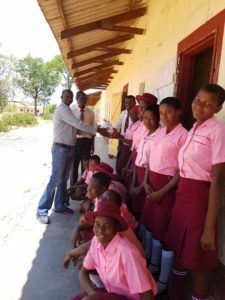 All funds raised are being used to build a sports complex with acceptable health and safety standards, visit young people and families affected by HIV/AIDS and visit schools and public places to promote HIV/AIDS awareness. Africa faces consequences of dealing with HIV infections and it is clear that children of all ages have to deal with a myriad of complex and taboo issues. Many parents with the disease do not live long enough to see their children into adulthood and many children have to deal with bereavement at a young age. Parental guilt and subjects that we least like to talk to children about including drug use, sexuality and death are made even more difficult in a climate where families live in fear of the stigma that the disease presents and the potential reaction of those around them, making it less likely to ask for help and therefore causing increased concerns. A child whose mother has cancer will receive sympathy and support from teachers, neighbours and friends, however parents with HIV may find it difficult to get the same response from those around them. However, the community still needs to do something for the poor needy kids. Every effort you make to contribute will make a difference to some souls in Africa. We’re so happy we could help Thembalethu Foundation by donating football equipment to the charity. We hope that our small gesture will make the difference for their future event. To see what the foundation is doing please see the video below!